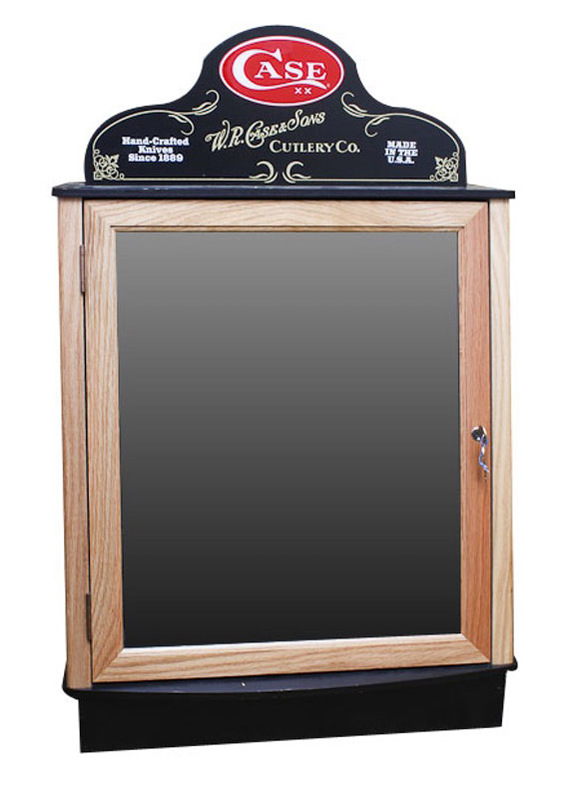 Glass Top Boxes and picture boxes work just like custom framing for the ultimate presentation of a product, photo, antique, or graphic, but unlike framing, these open up with a storage compartment. Glass Top Boxes allow you to view items with the lid closed as the glass can be screen printed, laser-etched and overlaid with 24-karat gold. Whether it’s one piece or thousands, we can create a custom wood product that is a sure conversation starter. 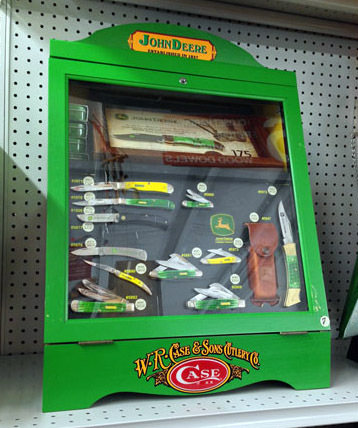 Inside this case is one of our custom knife handle embellishments. 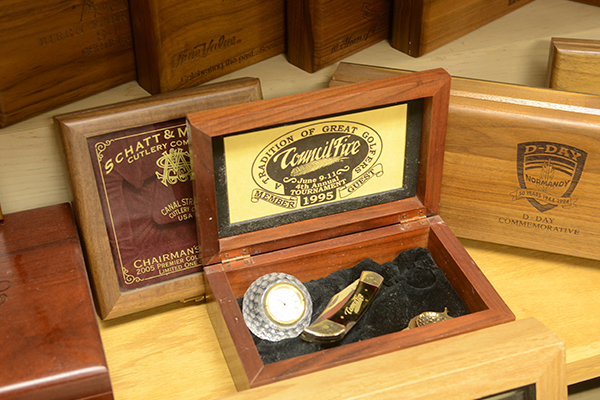 A simple wood box takes on a new level of sophistication when laser-engraved with a brand logo. 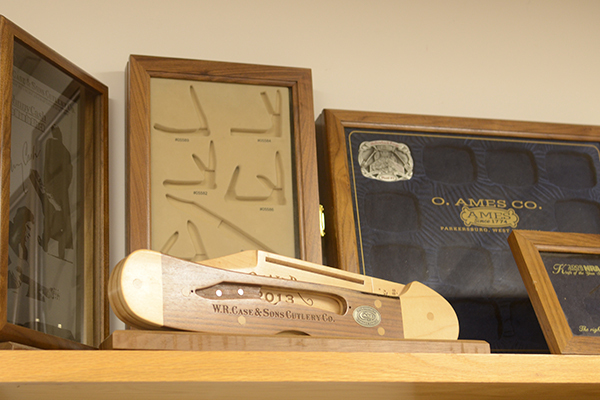 Walnut, Cherry and Alder are some of the best woods to engrave. 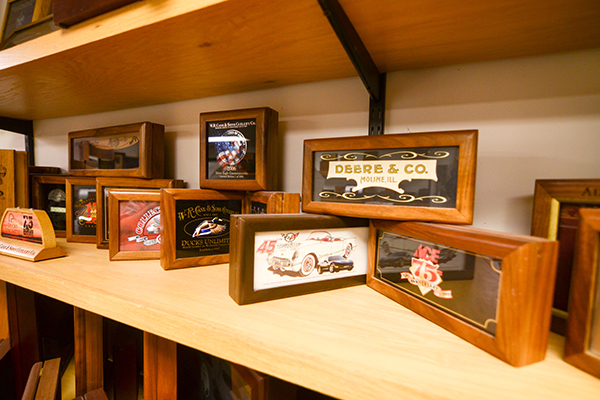 Inlaid wood boxes add a dash of color and a much different look than laser engraving. These are souvenirs and gifts that will be impossible to forget. What is the value of a plaque presented to someone retiring after decades of loyal service or efforts to improve safety or efficiency? 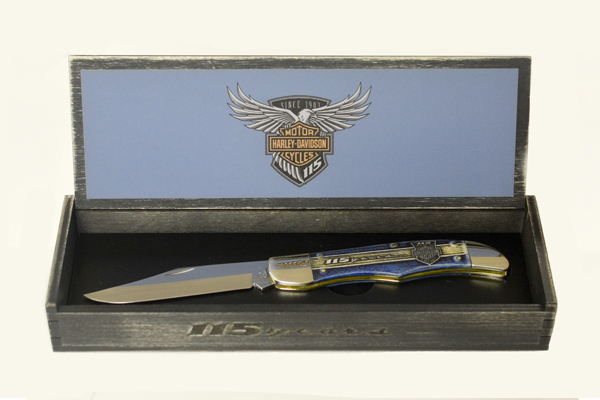 Laser-engraved products elevate the prestige of items presented to employees, customers, and vendors. 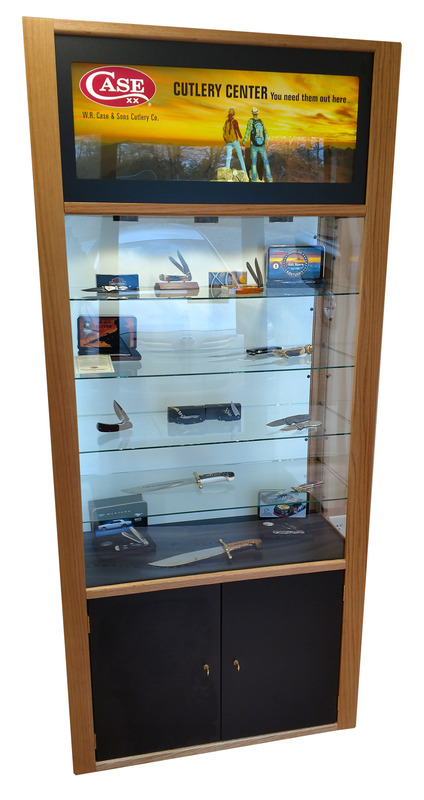 These products include things like a 30-inch working lockback wood knife or bases for miners lamp. 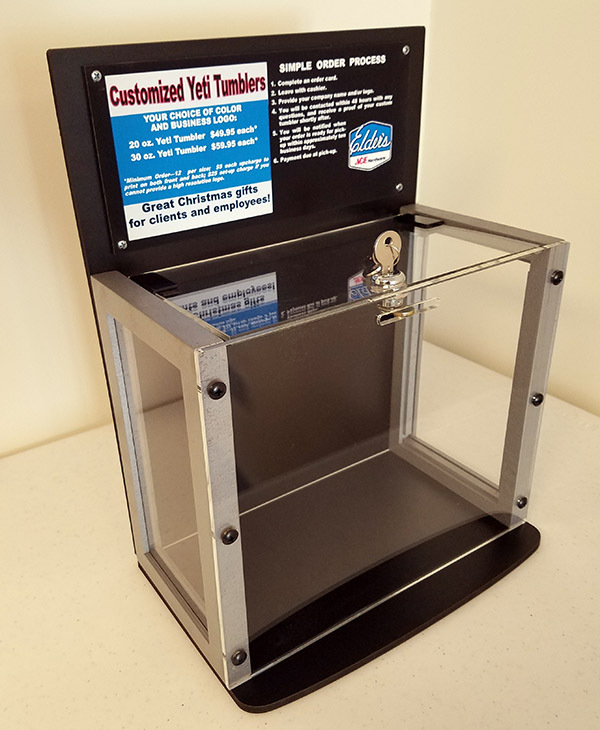 Countertop and Freestanding Point-of-Purchase displays enhance the perceived value of goods available for purchase in retail stores. 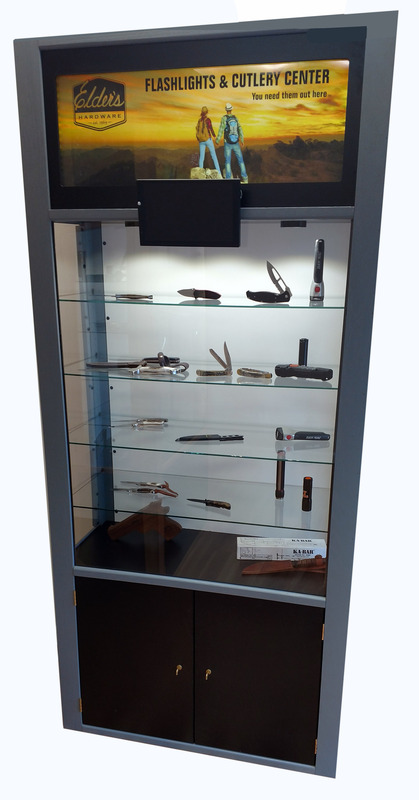 These can be created to specifications with lockable display areas and storage for backup stock of the product. 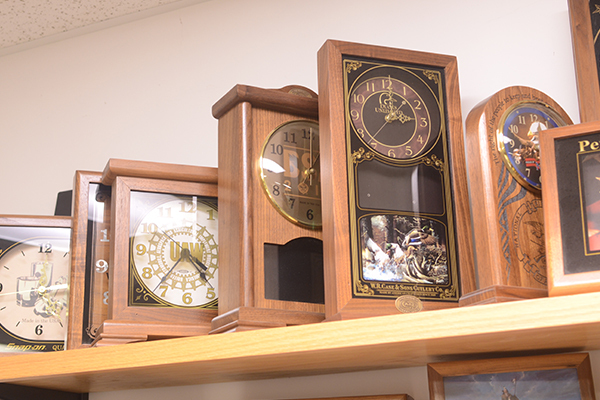 Clock faces can be incorporated into a variety of custom wood products to display items mounted inside, with logos of brands laser-engraved. Call (423) 476-7792 or fill out our form.